Favorite Book: "The Diggers "
Favorite Game: "Matching Game "
Favorite Toy: "My Backhoe "
Favorite Place to Go: "Aviary"
All of sudden, Liam looks & acts like such a big kid. Three should be an adventure for us all! He is brave & daring, yet cautious at the same time. He is incredibly smart; watching his brain at work amazes me each day (he definitely has Conor's engineer mind)! He is happiest outdoors & has quite the free spirit. He's a snuggler all day long (I'm pretty sure physical touch is his love language). He still naps once a day, but I think they are going to be happening less & less. For most of the year he slept with his monkey & blanket, but decided he no longer needed them on the day Finn was born. Liam is the most loving older brother and already wants another a baby, "a sister baby!" I could gush about him all day long!!! However, if I had to pick just two words that would describe him best, they would be sweet & gentle. We love you Lamb! You've given us the best three years of our lives! Happy three, Liam :)!!!! So sweet he wants a lil sissy! Happy birthday to Liam! 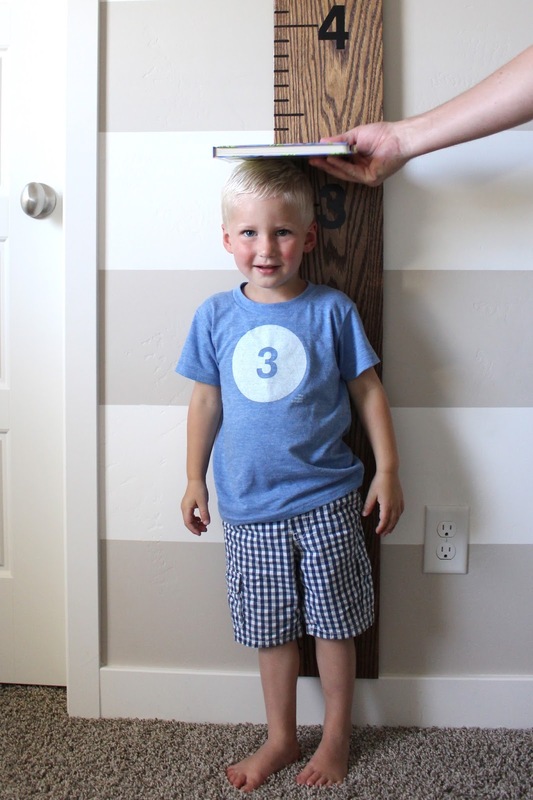 We do the same thing with the book on the head to measure! I just asked Carter all of the questions you asked! Yogurt is his favorite food too! Liam once ate a 32 oz tub of greek yogurt in one day....eek! But so good! Happy Birthday Liam! He really does seem like a sweet and gentle boy! Happy birthday to Liam! He is ADORABLE and looks like such a big kid in these photos! XO Chelsea play. wash. rinse. repeat. I agree! Such. A. Big. Kid. Happy 3rd birthday Liam!! I love reading about what other kids are into. Going on hikes and adventures is O's favorite thing to do also. 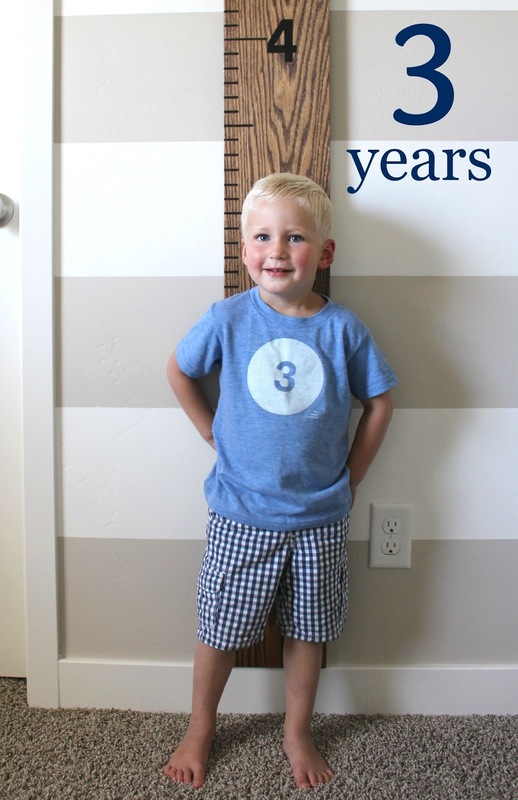 Did you make the growth chart? We're planning to make one like that for the boy's room and I've been reading some how to's. If you made it and have any tips, send them my way! What a sweet boy!! :) Sounds like Liam is such an awesome big brother especially, what a fun personality. Hope all the birthday celebrations were A+. Happy 3rd birthday sweet boy!! Love that he already wants another baby; so sweet!! Happy birthday Liam!!!! He is oh so sweet! What a cutie! I love his answers to the questions, especially his song choices! He sounds like just the sweetest little boy ever! Lily's favorite song is Thinking Out Loud too. Love that physical touch is his love language. So very sweet. Three is such a fun age! Such a bittersweet age too. Happy Three!!! Three is definitely an adventure. Two still seems toddler. Three seems like big kid...little big kid but still big kid! Love his fave toy. So sweet! Liam looks like such a sweet and gentle boy and you can tell that he loves being a big brother! I seriously can't believe Mason is three also... I don't know why it hit me so hard but I guess it's because he is no longer a baby or a toddler... he's not a pre-schooler and that just sounds so old to me. I'm not ready for him to grow up so fast! Sweet Liam! Most handsome three year old around:) Hope he had a very happy birthday! Finn is lucky to have such a sweet big brother!